This article is about a Mario Party 2 battle minigame that uses balloons. For a similar minigame in Mario Party 8, see Bumper Balloons. 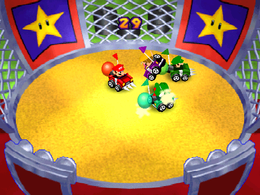 Bumper Balloon Cars is a Battle Minigame in Mario Party 2. It is a game of survival. The players must try and pop each others' balloons with the sharp fronts of their cars. Game Rules – "Use your car's spiked front to burst opponents' balloons! Tilt your Control Stick up to move forward and down to move backward." Advice – "Tilt your to the side to change direction. Once you master the controls, bursting balloons is a breeze!" This page was last edited on May 29, 2018, at 11:16.